MRI equipment manufacturers continue to make incremental changes that work toward making this modality a more comfortable and affordable experience for more patients while simultaneously increasing image quality. Since 2007, when the American Cancer Society began recommending that women with a family and genetic history of breast cancer be screened with MRI, more breast centers, hospitals, and imaging centers began looking to include dedicated breast MRI systems. In keeping with its dedicated MRI systems, Aurora adds 3D registration to the equation with its AuroraCAD. According to medical director Steven E. Harms, MD, FACR, the high resolution and high contrast available with the Aurora scanner significantly improves image quality, allowing for more accurate diagnoses of difficult-to-detect breast cancers. The AuroraCAD with 3D registration compensates for patient motion between scans, allowing for more accurate views of lesions, according to Harms, and helps account for better than 70% positive predictive value, more than double the typical value of 7% to 30%. “That’s a huge difference,” Harms says. Harms adds that the Aurora system accounts for fewer false negatives, with a negative predictive around 98% compared with 85% for the National Cancer Institute-sponsored clinical trial. When it comes to biopsy technology enhancements, Aurora offers the AuroraBIOPSY system, which incorporates its own proprietary biopsy system. This digitally encoded targeting device and integrated MRI-guided biopsy software technology allows users to click on the lesion, then select the marker, and the software provides the coordinates for needle placement. Consultations can occur in the room while the scan is taking place. Finally, Aurora offers MRI scanning protocols that produce the same images as traditional systems but with greater speed, completing the process in about 10 minutes. This enhancement allows for better throughput and increased patient comfort. Harms sees this factor playing a greater role in places such as the Far East, where dense breast tissue is more prevalent and MRI is used more frequently than mammography for breast cancer screening. “They have a higher volume of breast MRI patients, but with these new scanning protocols, they can handle more than 20 patients a day,” he says. New study results involving the FONAR UPRIGHT Multi-Position MRI show more promise for patients suffering from whiplash injuries to receive proper treatment and reduce the belief that whiplash pain is a “nonpathologic chronic pain.” A July 2010 study of 1,200 neck pain patients reports that 150% more whiplash patients showed demonstrable radiographic pathology when scanned upright than when they were scanned lying down. According to Raymond V. Damadian, MD, president and founder of FONAR, the results of this study demonstrate that upright MRI examinations may provide more definite radiographic evidence and image characterization of the pathology that results in a patient’s whiplash symptoms, thus allowing for medical treatment to occur. “For the first time, definitive anatomic evidence can be provided of injuries sustained by whiplash victims in motor vehicle accidents,” Damadian says. The study, published by 10 authors from universities in the United States and abroad, also noted that “patients with a history of motor vehicle crash-associated neck pain have a substantially higher frequency of cerebellar tonsillar ectopia [CTE] of 1 mm or more than nontraumatic subjects” when examined with the FONAR UPRIGHT MRI. CTE was found four times more often in patients who experienced whiplash trauma and suffered from neck pain than neck pain patients who had not recently experienced some type of trauma. “In sum, the anatomic origin of the patient’s whiplash symptoms was successfully visualized 2.5 times more frequently when the patient was scanned upright in the FONAR UPRIGHT Multi-Position MRI than when he or she was scanned lying down in the conventional recumbent-only MRI,” Damadian says. The latest MRI developments from GE Healthcare touch on the points of delivering enhanced clinical and research performance, improving the patient experience, and boosting productivity for both radiologists and technologists. “We are continuing to improve patient comfort, workflow, productivity, and clinical performance,” says GE Healthcare’s Chief Marketing Officer Thomas Verghese, PhD. Movement by patients undergoing MRI scans will always be a factor when it comes to collecting clear images. Taking steps to minimize imperfections caused by patient motion, GE is updating its Propeller motion compensation package with the launch of Propeller 3.0. This enhancement not only reduces susceptibility artifacts in MRI brain exams but also makes corrections for motion in the body, Verghese says. Meanwhile, GE extends the application of noncontrast imaging with an application called 3D ASL (arterial spin labeling). Designed for quantitative brain perfusion assessment, this feature requires no contrast media injection and is safe for pediatric patients and those with reduced renal function. “3D ASL could be helpful in diagnosing and assessing stroke, TIA (transient ischemic attack, or ministrokes), tumors, neurodegenerative diseases, or vasculature problems,” Verghese says. In addition, GE offers noncontrast imaging with its Inhance 2.0 suite of MR angiography (MRA) techniques optimized for various anatomies. The suite consists of the following components: Inhance Inflow IR for assessing the renal arteries, Inhance 3D DeltaFlow for peripheral MRA assessment, and Inhance 3D Velocity for assessing cerebral and abdominal blood vessels. Introduced last year, the MR elastography technology MR-Touch is now commercially available, according to Verghese. This technology is an alternative to traditional physical palpation to determine tissue stiffness and is based on the MR elastography (MRE) technique developed through research conducted at the Mayo Clinic. It uses low-frequency sound waves generated in the body through an external acoustic driver in combination with MRI to measure tissue elasticity. Currently, the technology is used to probe the elastic properties of liver tissue. GE is introducing new options for its Optima MR450w 1.5T with “GEM” suite MRI scanner for oncology applications as well as new software designed to improve workflow in oncology practices. The company’s Radiation Oncology Options package is designed to enable clinicians to use the MR450w to perform radiation therapy planning on the scanner, which features a 50-cm field of view. The package is specifically designed to improve tumor targeting in the brain, head, neck, and pelvis. The radiation oncology package consists of a flat couch insert with industry standard indexing and MR-compatible positioning devices for the brain, head, neck, and pelvis. The Optima MR450w with GEM coil is awaiting 510(k) approval from the FDA and is not commercially available in the United States. With the Discovery line, the MR750w features a new design and a compact superconducting 3T magnet with zero-boil-off technology and active shielding. Still awaiting final FDA approval before becoming commercially available, this device is designed to provide a uniform signal and fat suppression over a large field of view. Patient comfort is taken into consideration with a 70-cm diameter and 130-cm length bore with dual-flared 78-cm aperture openings and ART noise reduction technologies. GE also introduced its Optima MR430s 1.5T scanner a compact 1.5T superconducting magnet able to site in only 200 square feet of space. This device, which awaits FDA approval and is not yet commercially available in the United States, is a product of last year’s acquisition of ONI Medical Systems’ MRI platform. Hitachi seeks to continue its focus on patient-friendly high-field MRI with its 16-channel Echelon 1.5T and Oasis Bore-Less imagers’ capabilities and value. New capabilities for the Echelon 1.5T include blood-sensitive imaging for viewing small veins and hemorrhage plus VASC-ASL, another new noncontrast MRA technique. VASC-ASL, a spin-labeled MRA technique, delivers high-quality vessel images without a contrast agent, providing a substitute to contrast methods for patients with renal impairment. The Bore-Less Oasis offers the scanning capabilities of horizontal field imagers plus unique clinical and patient comfort advantages. Oasis expands providers’ geriatric, pediatric, bariatric, sports medicine, breast, and critical care capabilities. The device’s new 660-lb table weight limit, 82-cm movable table width, and 190-cm extra-large body coil simplify bariatric imaging in particular. The boreless system has been installed at a large number of healthcare providers and boasts new clinical capabilities. In addition, the latest software for Oasis provides users with TIGRE-C, a dynamic abdominal imaging feature with an increased signal-to-noise ratio and temporal resolution and access to advanced cardiac imaging, MR spectroscopy, and tensor imaging. Technology advancements take MRI into new territory with the introduction of Ingenia 1.5T/3.0T, the first digital broadband MR in the marketplace. The increased signal-to-noise ratio and large field of view with Ingenia increases clinical performance, he says, making MRI more versatile for traditional applications like neuro and musculoskeletal as well as high-growth applications such as full-body, oncology, and cardiology uses. In addition, this new device, which is pending 510(k) approval, has a channel-independent architecture that allows for expanded uses without upgrading hardware or software. In the oncology realm, Philips introduced a configuration for its Panorama High Field Open 1T MRI scanner dedicated for oncology use. The magnet’s open scan configuration is well suited for radiation oncology, with a flat tabletop that resembles what is used on a radiation treatment system, and utilizes an external laser-positioning system for patient alignment and marking. This configuration enables the scanning of patients in treatment positions and supports MR-guided biopsies, brachytherapy, and other minimally invasive procedures. Philips also introduced its Achieva 3.0T TX Mobile MRI system, the first MRI system with what Philips calls Multi-Transmit RF. The proprietary multichannel RF transmission technology automatically adjusts its RF signal to each patient’s unique anatomy. Philips offers an Elite breast imaging package for its 1.5T and 3T scanners. This system, designed parallel RF transmission technology called MultiTransmit. The proprietary Multi-Transmit technology automatically adjusts the RF transmit signal to each patient’s unique anatomy, resulting in improved image contrast, image consistency and scan speed for some of the most challenging applications in 3T. to reduce total exam time by 30% minutes, includes advanced breast imaging techniques such as eThrive, a MammoTrak dockable patient support, diagnostic and biopsy coils, and the DynaCAD software for analysis and biopsy planning from the MR console. Meanwhile, Philips continues to work with its Sonalleve MR-guided high-intensity focused ultrasound uterine fibroid therapy system, which combines two modalities by integrating an advanced high-intensity focused ultrasound system into the patient table of the Philips Achieva MR system. Sonalleve is currently undergoing clinical trials in the United States but is available in various other countries. Efficiency in conjunction with optimal patient care are the driving forces behind the development and introduction of Siemens’ open bore MAGNETOM Aera 1.5T and MAGNETOM Skyra 3T MRI scanners. These devices, both of which have received 510(k) FDA clearance and are now commercially available, are the first Tim (total imaging matrix) 4G and Dot (day-optimizing throughput) systems. The fourth generation of Siemens’ RF technology begins with 48 RF channels at both 1.5T and 3T. This is currently the highest standard RF channel configuration offered at either field strength. With the Tim’s all digital-in/digital-out design, all RF transmit and receive components are integrated at the magnet, eliminating analog cables. This enhances signal purity and high RF stability, according to Fowler. Also introduced with the Tim 4G Dual-Density Signal Transfer is a new coil architecture that sends signals from two independent coil elements on a single wire using two different frequencies. This feature improves the signal-to-noise ratio and allows for a higher density of RF elements and channels within a given coil housing. Siemens’ exclusive Dot technology provides a customizable framework for patient personalization, user guidance, and exam automation designed to help optimize all aspects of MRI workflow. Dot is applicable for scans throughout the body and is adaptable to various patients and clinical indications. Both the Aera and Skyra have been commercially available in the United States since November 2009. With a goal of enhancing image quality and improving exam speeds, Toshiba introduced 32-element cardiac and head coils for its Vantage Titan MR product line—the 1.5T and the 3T scanners, the latter of which is pending FDA approval. The coils improve spatial and temporal resolution for advanced cardiac and neuroimaging. For cardiac imaging, the 32-element cardiac coil allows for a higher signal-to-noise ratio and improves image quality, according to the company. In addition, the new coil is designed to reduce exam time by allowing higher SPEEDER factors, which can increase imaging department throughput as well as reduce the time patients spend undergoing scans. Breath-hold times are also shorter, which therefore improves image quality and patient comfort. SNR improvements from the 32-element brain coil are particularly useful in reducing functional MRI scan times, according to the company. A current work-in-progress for Toshiba is its M-Power user interface, designed to improve technologist efficiency by reducing the number of steps necessary to begin an exam and also features advanced postprocessing software. In addition, software called The Atlas Compass automates coil selection, turning on the proper coil elements needed for a specific exam. Finally, a 3D volume imaging application called mVOX streamlines the imaging process by allowing for the acquisition of all 3D volumes with a Fast Spin Echo technique. The resulting isotropic voxels may then be reformatted into any plane without the need to have actually scanned in that plane. This reduces the time a patient needs to spend inside the MRI scanner. — Kathy Hardy is a freelance writer based in Phoenixville, Pa. She is a frequent contributor to Radiology Today. Since MRI was first performed on a human more than 30 years ago, the technology has evolved into a go-to diagnostic imaging tool. Along the way, research has shown that field strengths could be increased without harm to patients. In addition, receiver coil technology advanced to the point where multichannel coil systems of up to 32 coils could be created, restoring a full field of view while maintaining sensitivity. When industry experts peer into their crystal balls, they see the expansion of this imaging technology into areas where images are even clearer and in multiple dimensions and where patients will experience fewer discomforts during the scanning process. These benefits are seen stretching across medical fields as well, from use in cardiac suites to breast cancer treatment centers. Steven E. Harms, MD, FACR, medical director of Aurora Imaging Technology, speaks of the MRI developments in breast imaging. Mammography is only 50% sensitive and the sensitivity goes down to 30% in women with dense breasts. MRI has a sensitivity of around 90% to 95%, but because of the increased cost it cannot be provided as a routine screening tool. Harms, who is also a radiologist at the Breast Center of Northwest Arkansas, says that while costs can be difficult to manage, further developments could be made to improve efficiency. As the ability to conduct more scans in a day increases, so do the chances for reduced costs. “With new scanning protocols, scans can be completed faster, and you can complete more scans in one day,” he says. Faster scans can bring more comfort to patients, and improving patient experiences with MRI is another area where system manufacturers see future growth. Director of the MR business unit for Toshiba, Stuart Clarkson believes that during the next few years, there will be a general trend toward improving patient comfort within the MRI environment. Part of obtaining higher-quality images involves incorporating improvements to various system components—scanners, coils, and applications. With these enhancements, however, come increased amounts of detailed data. Some of the reasons for increased levels of high-quality data involve advancements in technology. For example, Deepak Malhotra, Philips Healthcare’s vice president of marketing, believes that fully digital broadband RF technology is the technology that will “change the game” within the MRI realm in the coming years. While it’s being introduced now, “you will start to see the market react to it,” he says. Philips is also striving to make 3T field strength more clinically and commercially viable for mainstream radiology with innovations such as its proprietary patient-adaptive MultiTransmit technology. 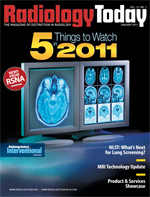 While today’s horizons consist of developments such as 3T scanners and different modalities integrated with MRI, the future appears boundless as researchers and manufacturers continue to strive toward increased image quality, physicians work toward better diagnoses, and patients anticipate speedier, more comfortable, and less costly MRI exams.